Are you looking for ways to “green up” your lifestyle and live more lightly on the planet? Do you long for a greater sense of community where you live? Have you wished you could attend Dancing Rabbit’s Visitor Program, but can’t take two weeks away from your home life? If you answered yes to any of the above questions, we invite you to join us for our first ever Ecovillage Experience Weekend. Come see how we live and take new skills and knowledge home with you! Spend a long weekend with us at Dancing Rabbit Ecovillage and gather ideas, concepts, and skills for living lightly wherever you live. This unique program blends the “eco” with the “village” of our community life. You’ll have hands-on opportunities with natural building, low-carbon gardens and kitchens, alternative energy systems, and organic resource recycling. You’ll also interact with alternative economic systems, skills for human connection and cooperation, and creative fun – all part of life at Dancing Rabbit! And, most importantly, the course will guide you to take what you’ve learned and create an action plan for bringing it home with you. What will you gain by taking this course? Simply experiencing life at Dancing Rabbit can shed light on what’s possible for living lightly on the planet. And, if you’re like the hundreds of people who’ve visited, you’re sure to be uplifted and inspired. But this course takes you a step farther! This 3-day experience is all about what YOU can actually do within the context of your home and your lifestyle. We’ll guide you to create your own action plan for a truly do-able project, and we’ll support you to take steps to implement that plan at home. And, who knows, you might become an inspiration to others where you live! Sign Up Now and See What Living Lightly Is All About! 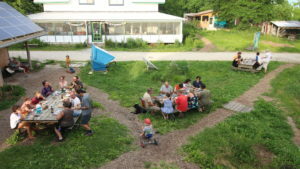 Dancing Rabbit Ecovillage, nestled in the rolling hills of Northeast Missouri , is one of the most well-known and successful ecovillages in the country, and one of the few in the Midwest. Founded in 1997, DR is home to many excellent examples of sustainable and eco-living. Plus the stars at night are amazing. You can check out the rest of our website to learn more about our ecovillage. Arrive on Friday, by 4pm & depart Monday afternoon. Meals provided from Friday dinner through Monday lunch. Instructors for this course include a variety of different residents and members of Dancing Rabbit Ecovillage, based on their particular expertise and skill sets. You'll have the opportunity to get to know and learn from some of the wonderful folks who make Dancing Rabbit the example of sustainable living that it is. The course fee includes camping accommodations in Dancing Rabbit’s wooded campground. Platforms for tents are provided, along with a composting toilet and access to showers in the Dancing Rabbit Community Building. Indoor accommodations are available to rent during the course for an additional fee. We have several options: rooms in cabins, private homes, and the bed & breakfast. Email us after you register to see what’s still available. The Milkweed Mercantile, our on-site eco-cafe, will serve you 3 meals a day, packed with as much nourishing, local food as possible. We can work with a range of dietary needs – let us know your particulars when you fill out the registration form. Please note that we do our best to accommodate different dietary needs but cannot guarantee that we will be able to. The all-inclusive fee covers: instruction, materials, meals, camping platform (bring your own gear), showers, bathrooms, WiFi, and community building access. Indoor accommodations are available at an extra cost.